Nous envisageons un yacht charter avec équipage en vacances : DestinationAlaskaAntarcticaArcticAustraliaBahamasCaliforniaCaribbean LeewardsCaribbean Virgin Islands Caribbean WindwardsCentral AmericaCroatiaDubaiFlorida French PolynesiaGalapagosGreat LakesGreeceIndian Ocean & SE AsiaMexicoNew England New ZealandNorthern EuropePacific NWRed SeaSouth AmericaSouth PacificTurkeyUnited Arab EmiratesW. Med - Spain/BalearicsW. Med -Naples/SicilyW. Med -Riviera/Cors/Sard. Tarif de location sur la base d'une semaine (7 jours/7 nuits) excluant les consommables – voir conditions de location. pour affréter le yacht entier pour une semaine complète (7 nuits, 8 jours). Nous proposons une offre tarifaire tout compris pour La majorité de nos yachts, surtout les plus petites de voile et de puissance yachts, ce qui inclut tous les aliments, les boissons et les activités offerts à bord. La majorité des grands yachts à moteur fonctionne sur un tarif plus tous les frais de base. Tous nos yachts sont avec équipage (capitaine & équipage). Greece is a rich concoction of contrasts; ancient and modern, sun and wind, mountains and sea. It is an idyllic place for cruising as one fifth of the country’s land is scattered among the many islands. One of the windiest regions is the Cyclades, a large group of beautifully wild, rocky islands. 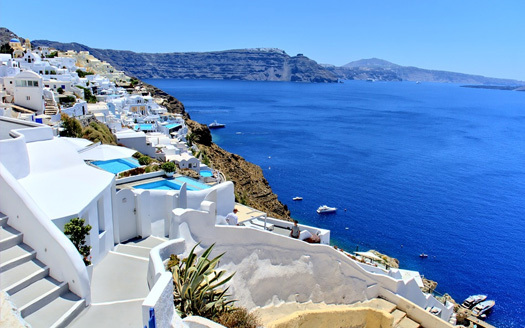 Some, such as Santorini, are volcanic in origin with astonishing landscapes. Others include Mykonos and Naxos. In the Ionian Sea the seven main islands include Corfu and Kephalonia. Near the Turkish coastline are the green and fertile Northern Aegean islands, and finally further South, Crete the largest of the Greek islands. With an alluring blend of natural island beauty, ancient cultures, and incredible cuisine there is an island to suit everyone.